Having a phone within reach is too much for some drivers so we've created laws that make taking a call, texting or looking up directions illegal while behind the wheel. There are also apps that try to restrict usage, like the Road Wars "game" I tried that's designed to reward focused driving. There's just one problem with Road Wars: It's one of the most distracting apps I've ever used. Road Wars is a new, free app made by the same guy who started Kayak. It's designed to promote safe driving and you're supposed to use it while you drive. That sounds like an oxymoron, and frankly, only the most competitive people in the world will probably use it to its fullest. But it's highly questionable whether or not they'll actually become safer drivers. Road Wars has an FAQ sheet but I'll summarize it: Your goal is to not speed and not take calls or texts off your phone while the app is running. That's how you "capture" roads. You then earn coins for your safe driving, and bonus coins for extended periods of safe driving. The app knows, however, if you're touching your phone. I tried this out on a very rainy day-before-Thanksgiving drive out of Boston. Road Wars suggests you have some type of stick-on cradle for your phone, but since I don't, I had to wedge it into a cupholder where it was sliding around. This ruined my score because every time I tried to put my iPhone back in an upright position, it thought I was using it while driving and going against the point of the app. I got a text message. I looked down and there was a big warning appeared on the screen warning me to not answer the text. The fact the app constantly flashes messages on the screen is the main distraction. Even if it were mounted in your line of sight, it's still useless information and yet it's hard to not look at the flashing thing right in front of you. I got dinged in my coin collection spree because I kept trying to keep the phone from falling out of the cupholder, but the fact the traffic was predictably bad kept me from getting dinged on speed limit penalties. When you are not driving your car, Road Wars brings you to a drive status screen, showing you your overall stats and stats for the day. From here you can click on the "Attack" button at the bottom of this screen. To see roads you have won or lost, click on your own name on the Attack screen, then click on the Activity button. At the end of the drive, I had no idea how to interpret these numbers. Why was I getting coins? Even if I had friends on this app, why would I want to "attack" the roads that they travel on? It's even less glamorous than being mayor of somewhere on Foursquare. For people like me, Road Wars is totally useless and just shifts the distraction from one app to another. For super-competitive people, it might make staying within the speed limit and not reaching for your phone more distracting than it needs to be. You should only have one job to do while driving a car: Driving the car. If you really want to avoid driving distracted there are a few things you can do, besides the obvious turning off your phone. Sprint has an app for its customers that redirects your calls to voicemail if you're driving. Textlimit similarly prevents texts from popping up while the car is moving at a certain speed. 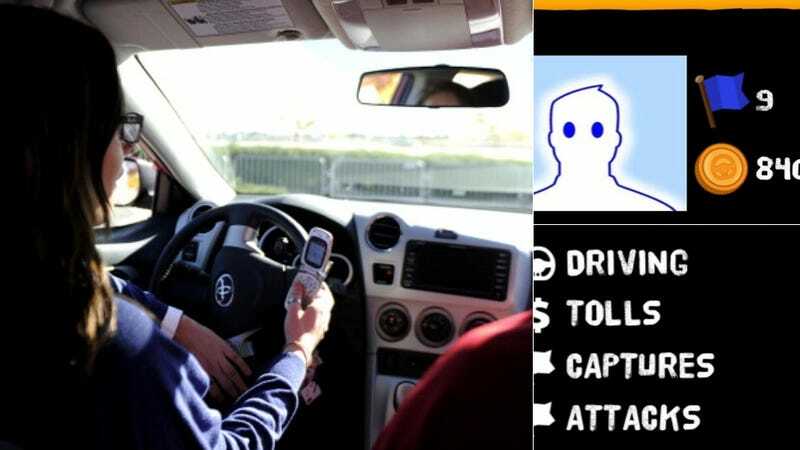 And then there are the car manufacturers themselves pushing features on us like "text-to-voice" so we don't have to move our eyes and hands anywhere. Theoretically. It's not just that Road Wars constantly entreats you to take your focus off the road, it's that it tries to make being socially responsible into a game. If you're a responsible person you'll probably limit your phone use while driving. If you're not responsible, a cumbersome, confusing, overly complex game isn't going to help.